It is time for another Earth Mantra release. 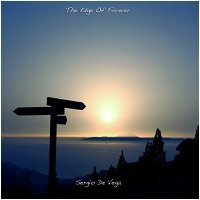 Likewise it is time to welcome a new artist to our family, this time ambient explorer Sergio De Vega and his brand new release The Edge Of Forever. We have long been fans of Sergio's deep and introspective ambient guitar work, having listened to many of the pieces he has made available on the Internet Archive under the moniker Srg. So when we learned we had the opportunity to release a brand new album by him on Earth Mantra, we were of course quite interested; once we heard the music, however, we knew that this was a work that our audience had to hear. Put simply, this album practically redefines the word 'depth'. Clocking in at two and half hours, the bulk in part one of the title track, this is the kind of music that draws the listener in and literally suspends time. From the soft, melancholy strains of piano to the lavish soundscapes of slowly evolving tonal washes, The Edge Of Forever immerses the listener in unhurried waves of sound, providing the perfect backdrop to nearly any activity. In particular, we found this music to be nearly ideal work music, creating the kind of setting that allows maximum creativity and productivity while simultaneously soothing and relaxing. Really remarkable work. The first piece was based on a guitar improvisation Sergio recorded in late February of 2011. As Sergio himself describes it: "... a few weeks later one of my dearest friends died in an accident while working and it was under this tragic circumstance that I started adding more material into the original improvisation, especially the opening piano motifs, During the following months I kept coming back to the piece and the length kept expanding, until I decided to settle around the two hours mark. I wanted the music to sound as it was coming from a far away source but at the same time engulfing the listener, thus a lot of panning effects are taking place but at such a slow rate that these are somehow difficult to spot". Nearly all of the textures on the album are guitar-generated, subsequently altered using various processes involving convolution and time stretching, providing the shifting swells that can be heard throughout part one of the title piece. Part two is another improvisation that somehow fit with the spirit of the first part, despite the fact that it was recorded over a year prior. The third and final track was inspired by and dedicated to Sergio's wife Fiona, a nice capstone to the epic journey that is this album. All in all, The Edge Of Forever is one of those sublime ambient releases that can delight again and again, and one that we think fans of light ambient and space music alike will enjoy immensely. We're very proud to finally release something by Sergio De Vega, and we hope to hear much more from this gifted artist in the future. Highly recommended. Beautiful! This Site is amazing! Thanks! An absolute must download for all ambient listeners. 5 stars! This is a must download for all ambient listeners.